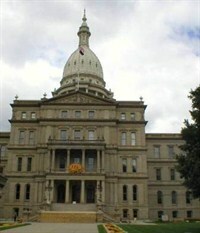 Michigan State Capitol, a historic landmark building built in Lansing, Michigan in 1879, proudly displays its post-Civil War style of fireproof monumental architecture. Following the national trend of modeling state capitols after our nations capitol in Washington D.C., the building was constructed to house the state government, as well as to serve as a suitable repository for mementos of the war itself. Enduring extensive historical restoration from 1987-1992, the building’s interior and exterior was returned to its original appearance, while being adapted for the future as a modern hub of governmental activities. Updating the heating, air conditioning, ventilation, lighting and electrical systems were a major part of the restoration process. The renovated offices and its employees currently occupy 4 floors and approximately 180,000 cubic feet of space. The ventilation and electrical systems are located in the building’s basement or below ground outside of the landmark building. Ground level air intake louvers are utilized to draw outside air into the heating and ventilating units, as well as to provide cooling to electrical systems that control the lighting used to illuminate the exterior of the building. Maintenance staff complained that through-out the year, debris from grass clippings, trees, crop farming, snow, insects and trash were being drawn into the air intake louvers. Airflow obstructions in these types of equipment can be a costly expense, requiring cleaning of at least 4-6 times per year to prevent equipment damage and allow the systems to run at peak efficiency. Continuous cleaning required removal of the grates, and a huge block of man hours and equipment downtime. Midwest Air Filter, an air filtration specialist and distributor out of Lansing, Michigan, came up with a cost effective, long-term solution incorporating Permatron’s custom air filters for their customer at the Capital Building facility. Midwest recommended Permatron’s patented PreVent® Equipment Protection Filters to effectively prevent debris from entering the ground level louvers above the air intakes. Custom air filters were designed and manufactured to equipment specifications, multiple sizes ranging from 21.5″-30″ wide by 39″-75.5″ long were needed to protect the 2 large lighting system louvers and the 32 intakes leading to the HVAC duct work. Permatron sewed vinyl binding to the edges of three-dimensional UV protected electrostatic 3-dimensional media, and then inserted numerous heavy duty grommets spaced every 4″ around all four edges. Disposable zip ties are used to affix the PreVent filter to the top of the metal louvers. No equipment modifications or electrical hookups are required. PreVent filters are easily cleaned in place by rinsing with a hose or using a portable shop vacuum or landscaper’s blower. 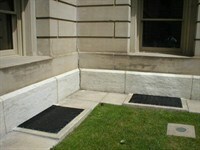 The black polypropylene media is UV protected and contains an inherent electrostatic charge that won’t diminish over time, so it will provide the Michigan State Capital and its tax payer’s years of equipment protection. PreVent® the damage before it’s too late!